Came across this on the internet. I have some ideas regarding this but I wanted to know more such reasonings. Fundamentally, you have jumped in without a definition of the length of an arc. The circumference isn't approximated by the sum of lengths of the lines drawn as shown in the image, but by the sum of the hypotenuses of the right-angled triangles formed around the edge of the circle. Not the answer you're looking for? Browse other questions tagged pi or ask your own question. Why is it hard to prove whether $\pi+e$ is an irrational number? 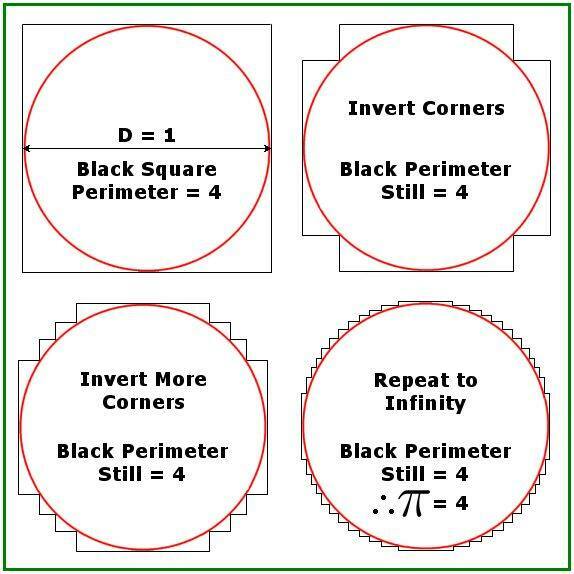 How can this step in the proof that pi is irrational be explained? Are these two functions equivalent? Another question about the distribution of pi digits (and other famous irrationals). How often does $\pi$ contain a sequence of digits $x$ at decimal place $x$? Is there a sufficiently reachable plausibility argument that $\pi$ is irrational? How is Euler's Formula Wrong?